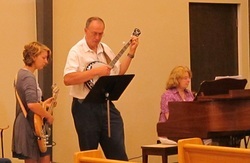 At Bethel, we sing both traditional hymns and contemporary worship songs. A once a month worship night, sponsored by Mount Carmel Bible School, held at the school (4725 - 106 Avenue). It's an inter-church event that a handful to a couple-hundred people participate in each month. Though attended mostly by those in high school and College & Careers, it is open to all.